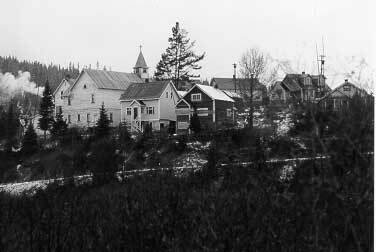 The Manager's Houses were among the largest in the Townsite and were built for the Townsite manager, mine mechanic, mine accountant and mill superintendent of the Cariboo Gold Quartz Mining Company. Bowman Crescent was called "snob hill" by the miners in Wells. Included in these houses was Fred Wells' house, which was constructed in 1933. Though it was not as fancy as one might expect of the president of the mining company with his own chauffeur and Cadillac, it may possibly have had the best view in town, overlooking Jack of Clubs Lake and the mine itself. As with the smaller houses, these were constructed in 1933-1934 by the Northey Construction Company for the Wells Townsite Company.